More than a cause of a simple infection, viruses are often involved in the development of serious diseases. Such is the case with liver cancer, which often develops in an organ that has been weakened by hepatitis B or C virus. Researchers at Inserm, the Paris Public Hospitals (AP-HP), Paris Descartes University, Paris 13 University (USPC), and Paris Diderot University have just identified the role of a new virus, hitherto unsuspected, in the occurrence of a rare type of liver cancer. This study, based on follow-up and observation of 193 patients, is published in the 24 August issue of Nature Genetics. With over 8,000 new individuals diagnosed annually, liver cancer mainly affects men, and is a major cause of death worldwide. Among the different types of liver cancer, hepatocellular carcinoma usually occurs in a liver that has already been damaged by illness. The liver may, for example, have been weakened by excessive alcohol consumption, obesity, or chronic viral infection by hepatitis B or C viruses, which causes irreversible liver lesions leading to cirrhosis. Cirrhosis patients generally undergo regular tests to detect cancer. However, in 5% of cases, liver cancer occurs in patients who had not reported cirrhosis, and the reason for developing the cancer remains to be identified. Jessica Zucman-Rossi and her staff at Inserm Unit 1162, “Functional Genomics of Solid Tumors,” focused on these patients to determine the risk factors that had contributed to the development of their cancer. 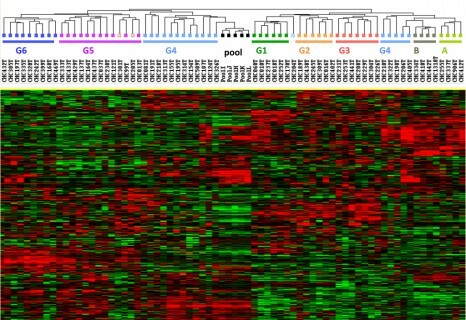 In the genome of tumour cells of 11 patients, the scientists observed the insertion of a viral DNA segment from adeno-associated virus type 2, known as AAV2. This virus has been considered non-pathogenic for humans until now. In order to confirm the virus’s involvement in the cancer, the research team compared tumour tissues with normal tissues. They thus confirmed their hypothesis: the integration of viral DNA was found more often in tumour cells than in healthy cells in these 11 patients. Moreover, 8 of these patients did not have cirrhosis, and 6 of them presented no known risk factors for liver cancer. By studying these malignant cells in greater detail, they discovered that the virus, when inserting its DNA into the genome of the patient’s cells, targets genes that are important in cell proliferation. Jessica Zucman-Rossi and her colleagues have shown that AAV2 leads to excessive expression of these genes which, according to the researchers, may favour tumour development. By this work, the researchers have identified the involvement of AAV2 virus, previously thought to be harmless, in the occurrence of hepatocellular carcinoma, particularly in the rare cases of cancer that develop in the absence of cirrhosis and without an identified cause. These results also call for caution: “AAV2 is often used as a vector in gene therapy. Although the insertion of its DNA into tumour promoting genes is rare, and probably a chance event, precautions must be taken regarding the use of this virus,” explain the authors. This work was supported by the French National Cancer Institute (INCa) via ICGC and PAIR-CHC NoFLIC (with the participation of ARC Foundation) and the French National Cancer League. Tumour sequencing was performed by IntegraGen, in its laboratories located at Genopole, Evry.